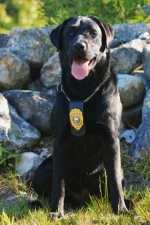 Conservation Canines or "K-9s" are a unique tool to assist New Hampshire Fish and Game Law Enforcement in their investigations, apprehension of violators, and conducting search and rescue missions. Conservation Officers work with their canine partners conducting tracks, area searches, evidence detection, fish and wildlife detection, and search and rescue activities. Join Conservation Officer James Benvenuti and his Conservation K-9 Cora for an informational presentation and demonstration about their training efforts and hear more about their amazing working relationship. 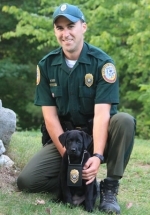 As the Conservation Canine program is fully funded through donations, we will be accepting donations on behalf of the NH Fish & Game Conservation Canine Unit. If you are unable to attend but would like to support this program, donations can be sent to: Wildlife Heritage Foundation of NH – Canine Fund, PO Box 3993, Concord, NH 03302 -- or you can give online.